You'll find that THRIVE freeze-dried potato dices are perfect in casseroles and soups. They also make a wonderful potato salad for all your summertime barbecues and picnics. We've taken care of all the washing, peeling, and chopping so THRIVE freeze-dried potato dices are ready to use with just simple rehydration. Since THRIVE Potato Dices rehydrate so quickly you can use them in many different potato dishes. Simply rehydrate, drain, and cook, bake, or fry like you would a fresh potato. 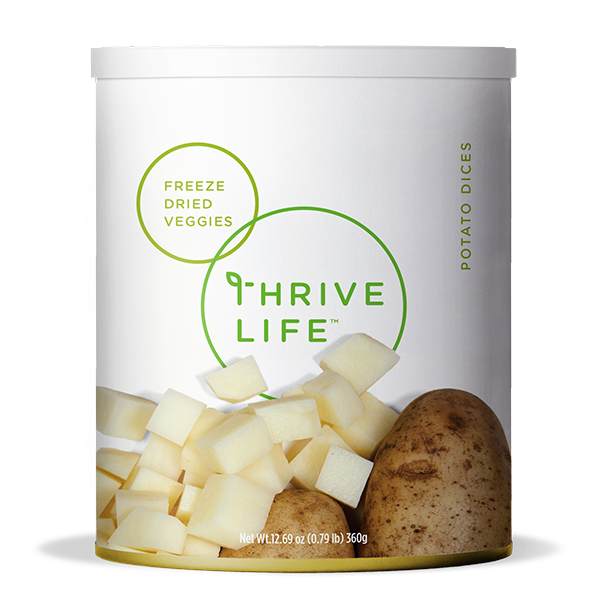 With THRIVE Potato Dices you will receive a healthy serving of beneficial carbohydrates and vitamins that will help you maintain a well-balanced and active life. Add 4 cups of hot water to 1 cup of potatoes and let sit until tender. Let potatoes soak for 3-5 minutes until tender. Drain water. Potato Dices are freeze dried and hold their starch better than Chunks, making them better for creamy soups and chowders, mashed potatoes, and potato salad.